As a French-German research team we conducted a survey with a sample of academic libraries and graduate schools in France and Germany to determine the current situation and trends in the publishing of electronic PhD theses and dissertations (ETDs) under Open Access (OA). The percentage of OA theses varies depending on the country, the research field, and the institution. Not all ETDs are available in OA for a variety of reasons, including confidentiality, embargoes, author-imposed restrictions, and a lack of encouragement and/or requirement by libraries and graduate schools. The survey reveals qualitative and structural differences between France and Germany in this area. Here we discuss the survey findings, the methodologies used in the survey, and the various policies (or lack thereof) and their impact on ETDs and OA. A strategy is outlined for moving towards ensuring that publishing ETDs under OA becomes routine, and an electronic version becomes the only manifestation of a thesis. European and American studies on electronic PhD theses and dissertations (ETDs) reveal that not all of them are available in Open Access (OA). Some ETDs, even if they are not confidential, may be limited to on-campus-only access and/or be under embargo, or are not published in OA for other reasons. As a French-German research team, we conducted a survey of the situation and tendencies in ETD-publishing in a sample of academic libraries and graduate schools in France and Germany. France: The number of OA theses increased from 12% of the PhD theses in 2009 to 24% in 2012. There was an increased number of embargoed PhD theses, as enforced by the libraries, from 1% of the ETDs in 2009 to 7% in 2012. On-campus-only access restrictions on ETDs increased from 5% in 2009 to 28% in 2012. 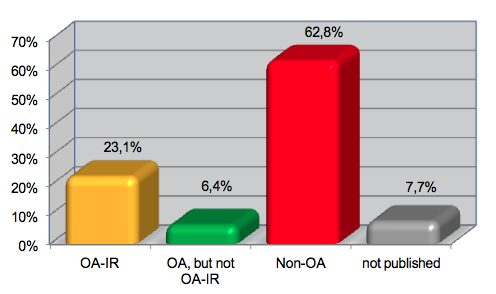 Germany: The number of OA theses increased slightly from 41% of all theses in 2009 to 47% in 2012. Furthermore, very few libraries reported access restrictions. There are however some individual cases  less than 1%  where the author asked for restrictions because of confidential material, etc. The different policies and the results generated by those policies are discussed here, as well as the methodologies used. A strategy is outlined for how to move towards making publishing ETDs in OA the regular case, and making an electronic version the only manifestation. A small but growing number of European and American empirical studies on electronic PhD theses and dissertations (ETDs )1 reveal figures on access and restriction (see an overview by Schöpfel & Prost, 2013a). An informal survey among 92 US academic libraries that mandate that PhD theses be submitted as ETDs shows that nearly all of them permit embargo periods whereas one third accept permanent restricted availability (on-campus)2. There are different factors and reasons for this situation, including individual choice by the author, publishing projects, or legal concerns, as seen by the library (see conceptual framework by Schöpfel & Prost, 2013b). Building on these previous studies, a French-German research project ("Electronic Theses and Dissertations: Access and Restrictions", EDAR) was launched in 2013 and 2014 by the GERiiCO Laboratory at the University of Lille 3, France and the Institute for Scientific Networking (ISN) at the University of Oldenburg, Germany, with funding and technical support from the European Social Sciences and Humanities Research Institute at Lille (MESHS). to collect and analyse information on the local habits and rules for handling restricted access to theses, such as embargoes or on-campus-only access. The second objective was to contribute to the preparation of an H2020 EU-project proposal, which will expand and continue this study in more EU countries in two different ways: by collecting sound empirical data for ETD dissemination, and by testing a sampling and survey approach to be adapted to the greater scale of the planned project. The final objective of this survey was to raise awareness of access and restrictions on PhD theses in an open environment among the community of academic libraries and graduate schools. This was extended to stakeholders, staff, policy makers and PhD students through communication via social networks, web sites and publications. A small but representative sample of academic libraries and graduate schools was selected from both countries (N=60). Fifteen French academic libraries were selected based on the representative sample from another research study on usage and scientific production in 2013 (ELICO Lyon and GERiiCO Lille). The 15 German university libraries were chosen at random. For the graduate schools, 15 French graduate schools ("Ecoles doctorales") were randomly chosen by region and scientific domain. The sample covered the fields of economy and management, mathematics and exact sciences (6), social sciences and humanities (2), medicine (2), and engineering (4). The German sample of 15 graduation committee chairmen ("Prüfungsausschussvorsitzende", PAV) were selected from those 15 universities included in the library survey. Care was taken that the 15 faculties (one from each University) were from different research fields. Thus the sample covered faculties in the fields of architecture, law, economics (2), mathematics and exact sciences (3), culture, linguistics, social sciences and humanities (2), medicine (2), and engineering. The survey took place between 16 January and 19 February 2014. The two questionnaires, one for libraries and one for the graduate schools, were prepared in English and then translated into French and German, with slight adjustments to be compliant with the local contexts. (All variants are available on the EDAR project website.) The sample institutions were contacted by phone following an email, with some basic information about the project and a link to the EDAR project website. The email contained a link to the questionnaire on the survey platform (direct access). The survey answers were recorded anonymously. Both countries combined, 77% of the selected academic libraries answered the survey, while only 27% of the graduate schools did so. The combined countries' response rate was 52%. In addition, we got a number of calls and oral responses from addressees stating that they were still 'working on the answers'. Methodologically, for the French sample, all data received were entered into the analysis thus reflecting the knowledge of the respondents on the publication channels for theses. For the German sample, only the statistics from those sets of answers which were complete for all the years were used. All academic libraries are handling digital and printed PhD theses in parallel. In France, most of the academic libraries (9) reported that they use the French national archiving system STAR for their ETDs. Three say they are preparing to handle ETDs and partially use STAR4. In Germany, all responding academic libraries (11) reported that they use the nation-wide established framework DissOnline for their ETDs. The respondents all accept ETDs. They publish them in their institutional repositories, and use the long-term archiving service offered by the German National Library (DNB). Data are transferred into the archive making use of the defined and agreed metadata set 'XmetaDissPlus'. No respondent in either country reported an 'ETD only' policy, i.e., a mandatory policy requiring that the student must hand in his/her PhD thesis as an ETD. Such an ETD mandate has already been instituted and enforced at some US universities. Across the respondents from both countries, only one third  exclusively academic libraries  stated that their institution has an explicit policy with regard to OA. In France, six academic libraries reported some kind of policy in favour of OA. The other universities recommend, or are in favour of, OA dissemination but do not require the deposit. In Germany, more than half (64%) of the respondents say they do not have an explicit OA policy for their university. Only 36% claimed that such a policy is implemented, meaning that they have decided to take steps to actively increase the OA ratio of PhD theses. With regard to OA policies in Germany, all libraries reported that they follow the nation-wide installed workflow scheme. This on-going nation-wide consent and cooperation framework was defined and established in 1995 by the German Science Foundation funded project DissOnline. Each university accepts digital PhD theses if they are handed in, publishes them in their OA institutional repository (OA-IR), and in addition sends a digital copy for long term archiving to the German National Library DNB. In addition, the metadata of all PhD theses are preserved in the academic library catalogue even if the text is not available. The OA institutional repositories (OA-IR) of all universities in Germany are registered by the DINI (German Initiative for NetworkInformation e.V.). In addition, the DINI workgroup e-publications offers the libraries a rich spectrum of services and gives advice for professionalizing their OA-IR. The policy of DINI is to promote and propel policies for ETDs to be OA. In addition, DINI hands out a certificate to an OA institutional repository if it is compliant with a minimum set of technical, structural and administrative requirements that are considered necessary by DINI6 for a professional service. Because the responses to our survey were anonymous, we could not track which of the university library responses came from a certified OA-IR. All of the French and German libraries reported the total number of PhD theses for the years 2009-2012. They reported 6,961 (French) and 9,547 (German) respectively, for a combined total 16,508 theses. The data from these libraries show the following development (Table 3). In neither country did the total number of PhD theses per year change significantly from 2009 to 2012. The total number of ETDs as a subset of all PhD theses, as summed up from the responses from the French and German libraries, was 6,258 ETDs, slightly rising over the years (Table 4). For OA PhD theses as a percent of all ETDs, Figure 1 indicates that a small portion of theses which are published OA are not listed in the library institutional repositories, but published elsewhere online. The chart also reveals that in arts and humanities, OA is much less popular than, for instance, in the exact sciences. How many PhD theses are OA? Due to embargo measures and other restrictions, not all ETDs are freely available via OA. For 2009 through 2012, French libraries reported 1,165 and German libraries reported 4,072, giving a total of 5,237 OA PhD theses (Table 5). At present, there is a significant difference between France and Germany. While in France, the percent of OA theses between 2009 and 2012 is 17%, the German libraries reported 43%. Another difference is the percentage of OA theses compared to all ETDs. Here, France is only at 54%, while nearly all German ETDs are reported as OA (99%). The probable reason for this difference, described above, is that the German libraries only reported the figures from their institutional repository where virtually all ETDs are OA; but not all ETD theses are disseminated via the library-hosted repositories. The number of French OA digital theses doubled between 2009 and 2012, from 12% to 24% of all theses. Yet, when compared to the ETDs, the number that were OA decreased from 60% to 52%, i.e., the number with restricted access increased. In Germany, the number of OA theses compared to all theses increased slightly from 41% to 47%, while the number of OA theses of all reported ETDs remains stable at a high level (99%, see above). Not all digital PhD theses are OA, due to embargo periods, on-campus-only restrictions, or because they contain confidential material. Regarding the development of reported non-OA PhD theses, compared to all reported ETDs, French and German libraries reported 420 (French) and 47 (German), a total of 467 theses that are non-OA (Table 6). The number of PhD theses with restricted or no access is 3%  6% of all theses in France (print and electronic) and close to 0% in Germany. As earlier, these figures must be interpreted carefully because for 26% of all ETDs the French libraries did not qualify the status regarding OA, while for reasons explained above (answers limited to content of institutional repositories) German libraries posted nearly all of their ETDs as "OA". However, the figures show that in France, the percent of PhD theses with restricted or no access increased from 1% in 2009 to 17% in 2012. German libraries reported that they do not impose any restrictions or any embargoes as part of their policy. Over the four years, less than 2% of ETDs are subject to restrictions, and then only as and when requested by the author. That means that at least 98% of the reported ETDs are OA. There are no recordings of their ETDs and OA/non-OA status for PhD theses which are not sent to the university institutional repository which in Germany is as much as about 50%. How do universities handle access restrictions? Do they handle them at all? And if they do, in what way? Only academic libraries answered this question, and French and German libraries answered in quite different ways. We define 'embargo and restriction' as limited access enforced by Library policy, and restrictions requested by the author, for e.g. reasons of confidentiality. In France, except for one, all academic libraries reported that they accept and can handle on-campus-only access, i.e. restricted access limited to the Intranet or workspace, and 75% of them manage specific embargo periods, ranging from six months to more than two years. Only one library said that they did not allow access restrictions (Table 7). German libraries answered that they do not impose or handle any restrictions or embargoes as part of their policy. Table 8 distinguishes between three types of access restrictions, as reported by the libraries: confidential theses (no access), embargoed theses, and theses with restricted access limited to the campus (Intranet). Overall, the on-campus-only limitation represents 65% of all access restrictions, compared to 25% for embargoes and 10% for confidentiality. But again, the differences between both countries are significant. 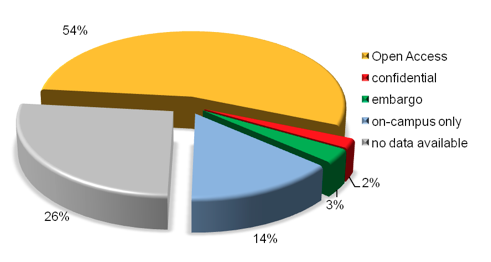 Figure 2 shows the distribution of access restriction related to the overall number of digital theses. While 84% of ETDs are freely available (OA), 5% are limited to on-campus-only access, 2% are under embargo and 1% are confidential. For 9%, data on accessibility are missing. The differences between the French and German samples are significant. For the same data but limited to France (Figure 3) only 54% ETDs are freely available. Fourteen percent are available only on the campus or via Intranet, 3% are embargoed and 2% are confidential. For 26%, data are missing. Because of the small sample size, these differences should not be over-interpreted, yet a future survey should be sensitive to these kinds of country-specific differences. The figures for Germany remained stable over the surveyed period. With regard to embargoes and on-campus-only access restrictions, only two of the libraries declared a 'yes', but then in the comment they stated that they only practise this if the candidate asked for it. They mention that there have been very few (less than 1%) cases. The German university libraries do not impose or suggest on-campus-only restrictions or embargoes on their own. Embargoes or restrictions (on-campus-only) are to be applied only for individual cases on request by the student (less than 1%). In France, the number of confidential ETDs remains stable at around 2%, while the percentage of embargoes and on-campus-only access restrictions increased between 2009 and 2012, from 1% to 7% (embargo) and from 5% to 28% (on-campus-only). The percent of OA theses compared to all theses increased from 12% of the PhD theses in 2009 to 24% of the PhD theses in 2012. There is an increase in the percent of embargoed PhD theses, from 1% of the ETDs in 2009 to 7% in 2012. On-campus-only access restrictions on ETDs increased from 5% in 2009 to 28% in 2012. The number of confidential theses remains stable (2% of ETDs). The percent of OA PhD theses increased from 41% of all PhD theses in 2009 to 47% in 2012. In Germany, very few libraries reported access restrictions. There are, however, some individual cases in which the author asked for restrictions because of confidential material, etc. These cases add up to less than 1% of the total. Roughly half of the academic libraries declare that they offer regular training classes and information materials for the technical preparation of a thesis, to include legal aspects such as restrictions and embargo. Only academic libraries appear to be concerned and engaged, because at least from our sample, graduate schools do not currently offer such services to their PhD students. The overall response rate of the questionnaire was 52%  satisfying for an online survey response, but also requiring cautious evaluation because of the small sample size and because of the nearly complete lack of exploitable answers from French graduate schools and German graduation committees. There may be a bias in that libraries which are more active in the field of OA and those that acquire digital PhD theses were more likely to answer the questionnaire. Also, the absolute figures on OA ETDs are probably an underestimate because the German libraries may have misunderstood the question. They may have provided figures only from their institutional repository and not included figures on digital theses which are not in their own repository. This also means that the percentage of OA PhD theses in the EDAR survey may be an underestimate because other OA-services of dissemination and preservation are not recorded by the Library (e.g. OA-journals, international research field specific archives, Institute/Graduate School servers, etc.). For the analysis of the responses by the libraries we employed two different strategies. For France, we analyzed all numbers as reported by the libraries of the country. Thus the results reflect the present knowledge of the librarians who responded, which proved to be quite incomplete. Alternatively, for Germany we picked only those responses which gave complete numbers for all years asked and which we trusted (excluding the one where the total number of PhDs was given as lower than its portion of ETDs). This, however, reduced drastically the dataset and increased the bias that the responses are from the few universities with the most engaged and knowledgeable librarians, not representing a good average estimate over all universities. A future survey must not be anonymous, and must allow for interaction, and for checking and researching to complete, correct, and confirm the locally known numbers. Compared to our 2013 review on access restrictions, the survey data appear consistent and comparable. Large differences of openness between institutions, ranging from 40% to 92% of all deposited theses in France; in Germany 98% of deposited theses are OA. This conforms to the situation in the United States, where one sees a disjunctive set of universities: a) those with an embargo policy which yields numbers as in France, and those without, which are similar to the German number of rare cases. Without the ProQuest figures, the percent of ETDs with limited access is 17%, ranging from 10% to more than 50% in France; in Germany only students have occasionally requested restrictions or an embargo due to confidential material., etc. This is a 1% rate. Data on specific forms of access restrictions (embargo, Intranet) are often missing or incomplete. In France, 17% are embargoed for six months to two years or longer (EDAR survey 3%) while the other 9% can only be accessed on-campus-only (EDAR survey 14%). In Germany, all PhD theses must be registered at the university library, but only those which are handed in as ETDs are archived at the local OA-IR. There may be more being published through other channels. At least in our sample, the academic libraries appear to be more interested and competent in OA than graduate schools or committees (PA) which are officially not directly concerned with regard to the processing and dissemination of PhD theses. They do not control and/or follow-up document processing statistics (and do not communicate between each other about the topic). Even if individual members of a graduate school or committee express personal attitudes on OA, no significant institutional opinion or policy can be identified. Sometimes, their information may be simply misleading. For instance, one respondent stated that "all dissertations of my faculty are of course fully OA. Anything else would not make sense nowadays." However, the analysis of the institutional repository's statistics revealed that the real number of OA theses is only 50% of all, which means that this PA does not know the candidates' decisions. On the other hand, academic libraries are directly concerned with the preservation and dissemination of PhD theses. They were responsive, and they provided at least partial figures on the processing of PhD theses. But they do not control all aspects, do not keep exhaustive statistics of key elements (such as embargo), some figures are missing, were not conserved, are not (or are no longer) available or were simply not communicated. The general impression is contradictory: in general, respondents appear in favour of OA. But the survey reveals a lack of awareness and also at least partially missing follow-up of the candidates publishing decisions. One of the major concerns of both institutions is with legal compliance and, especially in Germany, plagiarism. Their global approach appears to be risk avoidance with regard to intellectual and industrial property rights. The German copyright law "Urheberrecht", is in contrast to the Anglo-Saxon legislation, a security right of the creator covering his/her creations. This gives full legal freedom to the candidate in deciding the publication channel. He/she has to prove to the university that the thesis has been published. Thus, the author is the one who has to care about getting his/her thesis published; the publication channel is his/her individual choice. He/she can send several print copies to the local university library and to a publisher for print publication, he/she can send an electronic copy to the university library for publishing in its OA institutional repository (OA-IR), or he/she can publish the thesis elsewhere online. If the work is published, the library reports the 'has been published' note to the graduation committee. The graduation committee then issues the permission to the candidate to use the title 'Dr'. a mismatch between the persons in charge and the persons who bear the consequences: the candidate has the exclusive right to decide the publication channel, OA or not. The PA staff is not responsible for the dissemination of the thesis, their involvement is only temporary and they may therefore lack interest and knowledge about copyright, restrictions, patent law, digital publication channels, OA initiatives, technical requirements for ETDs (metadata standards, interoperability, long term archiving, etc. ), and full re-use of the scientific content for other research. a lack of sharing, networking and exchange of experience (virtual community) between professionals, PA staff and the PhD students. transition from print to digital: libraries and graduate schools are still in the transition, handling both print and digital versions. This may at least partly explain the limited experience and lack of statistics. a strong protection by intellectual property law: while administrative law allows for on-campus-only dissemination without authorization (OA to administrative documents), larger digital dissemination is not possible without formal permission from the PhD student. This contributes to a high rate of access restriction and on-campus-only (Intranet) availability and explains why French universities, with their academic libraries in charge of the dissemination of PhD theses, must find solutions that lie in between no access at all and free (open) access. lack of collaboration between graduate schools and academic libraries: at least in this particular area, institutions rarely work together, nor do they coordinate their actions regarding OA and dissemination of ETDs. One reason may be that French academic libraries are closely related to their university while graduate schools may involve multiple universities, with more than one graduate school on the same campus. Open, digital science is on the agenda of the European Union. In the European research area and beyond, researchers, scientific knowledge, and technology should circulate freely, through cooperation between the Union and the Member States, and among the Member States, in particular through the application of a coherent set of rules. OA to scientific publications and research data must be part of this policy. The EDAR survey confirms former empirical evidence on restricted access to ETDs, especially due to embargo periods and on-campus-only availability. Obviously, there is no need for new facilities and infrastructures on local, national or European levels. Today, the problem of OA to ETDs lies upstream, in local contexts that facilitate decisions in favour of embargoes or restricted access (on-campus-only access, Intranet). To put it in a simple way, pipes exist, but there is a lack of both fuel and pressure for ETDs and OA. The percentage of OA theses varies depending on the country, the research field, and the institution. Increasing this percentage requires solving problems in many areas: technical (workflow), legal, administrative (regulatory), institutions' traditions, and ethics. What is needed is a better understanding of the situation and a raising of awareness; lobbying at the national and European policy level; a comprehensive communication net for both candidates and for the responsible local staff; and more use of current training material. Future research should produce and disseminate more reliable and consistent empirical data on the processing of electronic theses and dissertations (ETDs) in a wide set of European countries with their different infrastructures and legal environments, in particular to address the problems and variations of access restrictions. It should, in this way, contribute to a better coordination of OA policies regarding ETDs in the European Research Area and beyond, to build a sustainable community focussing on the OA of research theses. This paper was prepared with funding support from the European Institute of Social Sciences and Humanities (MESHSUSR 3185), Lille, France. 1 In this paper, we use ETD as a generic term for digital PhD theses. 2 Survey launched in 2011 by Dorothea Salo and Sarah L. Shreeves, available here. 3 The German and French graduation systems are different, with institutionalized and disciplinary graduate schools in France and ad hoc graduation committees in Germany. Yet both are in charge of the follow-up and examination of the PhD students. We refer to them both as "graduate schools". 4 For more information on the French STAR infrastructure see Giloux & Mauger-Perez, (2008). 6In 2012, ProQuest conducted a study on ten years embargo trends (2000-2010) in the ProQuest Dissertations and Theses (PQDT) database. The surveyed corpus of 500,000+ print and electronic theses contained about 25,000 embargoed items (5%). Most of the embargoes are short-term embargoes, for six months to five years, but a small part of theses are under permanent (long term) embargo. So the information is that 5% ETDs are embargoed; but this does not means that the other 95% are all in OA. For more details, see ProQuest (2012). M. Giloux & I. Mauger-Perez (2008). "A new French circuit for the electronic theses". In ETD 2008 11th International Symposium on Electronic Theses and Dissertations, 4 - 7 June 2008, The Robert Gordon University, Aberdeen, UK. E.R. Hilf & T. Severiens (2013). "Was macht die Dissertationen-Online Diskussion in Deutschland?" ProQuest (2012). "Ten year embargo trends." In CGS Summer Workshop and New Deans Institute, Boston, Massachusetts, 7 - 11 July 2012. J. Schöpfel & U. Müller (2014). "Evaluer la qualité des archives ouvertes: Le certificat DINI". Partnership 9(1):1-21. J. Schöpfel & H. Prost (2013a). "Degrees of Secrecy in an Open Environment. The Case of Electronic Theses and Dissertations". ESSACHESS  Journal for Communication Studies 6, 2(12). J. Schöpfel & H. Prost (2013b). "Back to Grey. Disclosure and Concealment of Electronic Theses and Dissertations". In GL15 Fifteenth International Conference on Grey Literature. The Grey Audit: A Field Assessment in Grey Literature. CVTI SR, Bratislava, Slovak Republic, 2 - 3 December 2013. Thomas Severiens is Associate Researcher and Project Manager, Institute for Science Networking (ISN) Oldenburg, Germany. He studied Physics at the Carl von Ossietzky-University Oldenburg. In 1995 he started to develop PhysNet. After graduating, together with some colleagues, he founded the ISN. Since 2004 he has worked as a lecturer for Information Engineering and as a researcher at the University of Osnabrück and at the Humboldt University in Berlin. His research interests include the development of distributed library systems, user oriented scientific information portals, strategies for long-term preservation of the scientific research output, and development tools for full-text semantics. He is secretary general of the Coalition for Action "Copyright for Education and Research", an initiative supported by most of Germany's funding institutions, representing over 350 research institutions in Germany in the political area. Since 2009 he has focussed his research activities on strategical aspects for the sustainable and open visibility of research output. Paul Grabbe is Researcher at the Institute for Science Networking, Germany. He studied Social Science at the Carl von Ossietzky University Oldenburg. Currently he graduates in Social Policy at the University of Bremen. He researches social justice and political decission making and supports the Open Acces Strategy.